With the lofty Mount Huang and the Xin’an River running through it, the unmatched beauty of Shexian made it a fitting capital for the ancient state of Huizhou, a region marked by its picturesque scenery. The county of Shexian was founded during the Qin Dynasty (221-206 BC) and it is widely considered to be the birthplace of Hui culture. Over 100 structures in Shexian date back to the Ming Dynasty (1368-1644) and thousands date back to the Qing Dynasty (1644-1912), making it a veritable treasure trove of traditional Hui-style architecture. 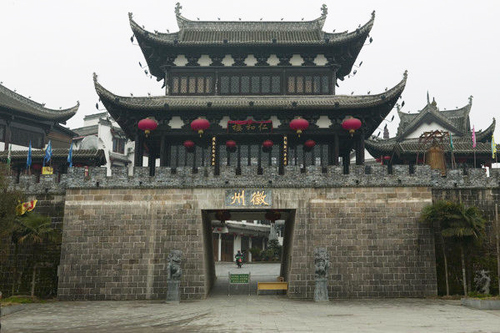 The most acclaimed are typically referred to by experts as the Three Wonders of Ancient Huizhou Architecture: the residential houses, the ancestral temples, and the stone archways. When it comes to these elaborate constructions, three truly is the magic number! The Hui-style residential houses are characterised not by their size, but by their white-washed walls, black tile roofs, elegant woodcut panels, and intricately carved stone reliefs. They may not be as large as the average mansion, but the Hui merchants more than made up for it by hiring the finest artisans to decorate both their exterior and interior. After all, as the old saying goes, you should always choose quality over quantity! The ancestral temples are similar to these houses in their grandeur, but they originally served an entirely different purpose. Each ancestral temple belonged to a specific clan or family and represented a holy place where they could pray to their ancestors. It was believed that the living could communicate spiritually with their deceased ancestors in these temples, and would frequently make sacrificial offerings to them. The deeply personal nature of these temples meant they were also used for family meetings, weddings, funerals, and any other significant ceremony related to the family. Nowadays these temples provide an invaluable insight into the history and development of specific families in the Huizhou area. They are delicate works of art, imbued with all of the love and respect that the clan members once had for their venerated ancestors. Located in the centre of Bei’an Village, the Wu Family Ancestral Temple is regarded as one of the county’s finest and most emblematic ancestral temples. This temple was originally founded by Wu Shidu in 1826, during the Qing Dynasty, and supposedly cost approximately 12,000 kilograms of silver to build. To put that into perspective, that’s roughly the weight of 24 grand pianos! From sophisticated tile engravings to ornate stone carvings, the temple is bedecked with all the finery money could buy. It is renowned for two wood carvings in particular: one of West Lake in Hangzhou; and the other of one hundred deer, all in different poses, grazing in the woods. The cost of all those deer must have been quite dear indeed! While the residential houses and ancestral temples of Shexian are undeniably magnificent, many people consider the stone archways to be the county’s crowning jewel. 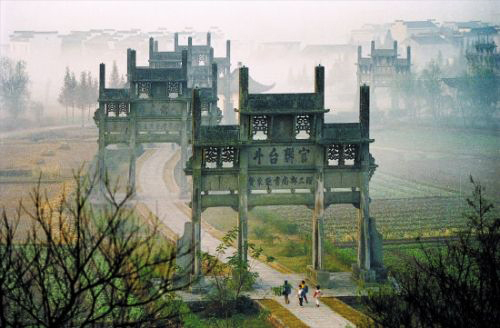 There are over 250 of these archways scattered throughout the county, the most famous of which are the Xuguo Stone Arch and the Tangyue Memorial Archways. In ancient times, the building of a special archway or “paifang” had to be formally approved by the Emperor himself! This was because these archways signified that the individual or group being honoured had made great contributions to or were viewed as positive role models by the imperial court. They could be built from tile, wood, or stone, and were typically placed at the entrance to a village, street, or tomb. The number of pillars and the patterns engraved on the archways were also imbued with a deep significance and usually denoted the status of the person or group being honoured. For example, patterns incorporating the dragon or the phoenix signified that the person was either a member of or close to the royal family, since these mythical creatures were the symbols of the Emperor and the Empress respectively. According to local legend, the Xuguo Stone Arch was the great exception to this rule! Xuguo was a renowned scholar during the Ming Dynasty who originated from Shexian and served as a teacher to three princes. When he discovered he was to be graced with an archway of his own, he took advantage of the Emperor’s vague instructions and constructed an archway of eight pillars, in spite of the fact that such an honour was reserved only for royal family members. Talk about pushing your luck! Nowadays, traveling through the county of Shexian is the ideal way to engage with ancient Hui culture. Along Doushan Street in the old city of Shexian, there are a plethora of time-honoured shops dealing in ancient wares, such as locally grown Huangshan Maofeng tea and Xin’an paintings. The Hui-style ink sticks and famed She ink slabs that are sold in Shexian are widely considered to be the best in the Huizhou region. Some stores even sell Chengxintang paper, which was considered to be the finest quality paper during the Qing Dynasty. So if you’re in need of some school supplies, Shexian is the place to be!